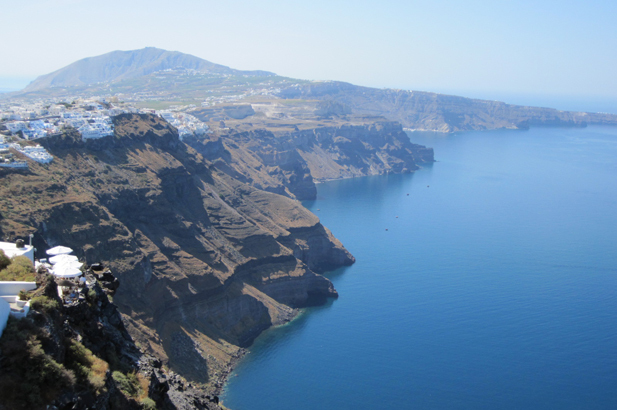 Santorini takes your breath away the first time you see it, especially if you arrive by boat and look up at the sheer rusty cliff soaring above you, with its frosting of villages lining the top. 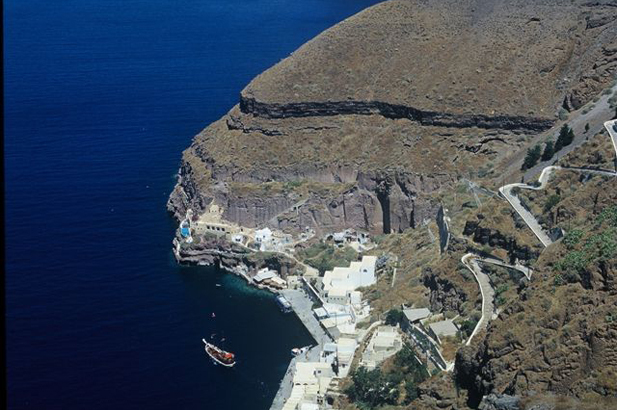 Hard to see how you will ever dock at the tiny little port carved into the rock, let alone get up to the village, as the sea churns away at the foot of the cliff. 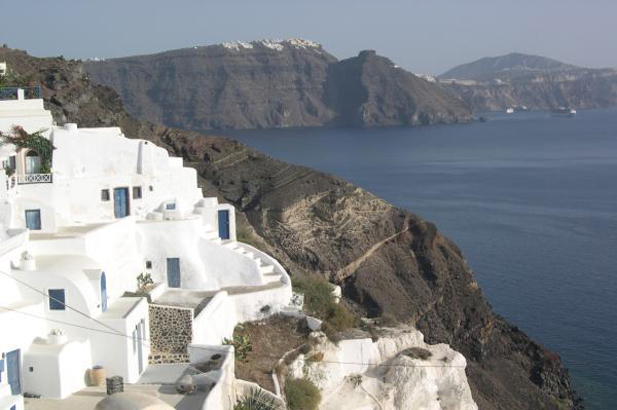 Santorini offers its visitors one of the world’s most exceptional vistas – the volcanic crater of ancient Thira, which blew 3,400 years ago. You are on the lip, overlooking a newly-forming, live, black island. Look left and right to staggering curving red, ochre, cream, brown and black striped cliffs rising sheer from the sea. 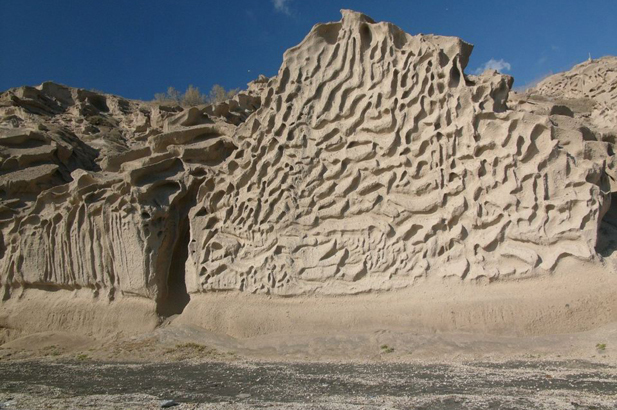 Snow-white habitations dance in the light on the very edges of these towering rock faces thrust up and outwards in a phenomenal explosion that brought down the entire Minoan civilisation. There have been many outbursts since as the tectonic plates of Africa and Europe collide, with the last major quake in 1956. But don’t worry – your charming cave-conversion nestled in the pumice has been rebuilt to withstand any future shocks. 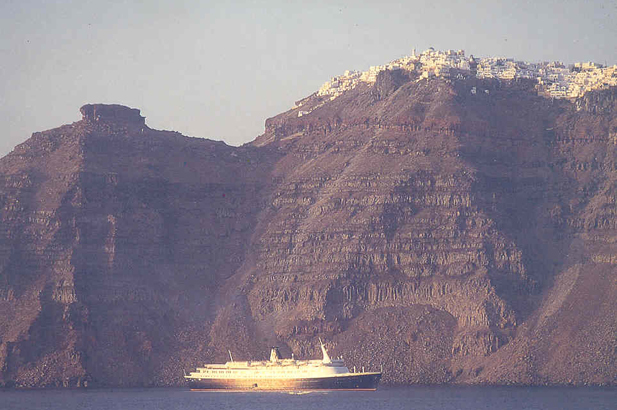 Before tourism, Santorini was another world – one of pirates, Venetian duchies, occupying Ottomans, fleets of sailing ships (170 in Oia’s prime), pumice mines (pumice, stronger than cement, was used to build the Suez Canal in 1869), tomato canning factories (those little cherry type grown in moisture-retaining volcanic soil are super tasty) and wine exports worldwide of both red and white. 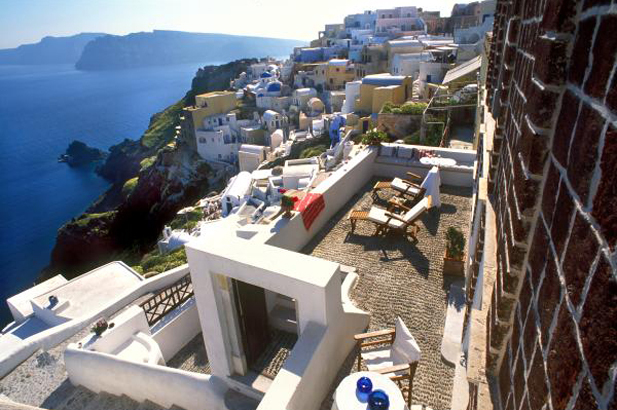 Many do not get beyond their villa poolside improbably perched on the extremities of the lava crust. But for those who do, there is much to see and do. 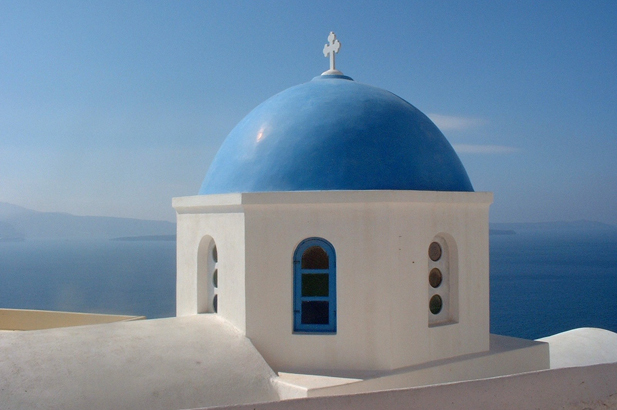 The incomparable light of the Aegean – the islands float on the blue and are washed by the light. 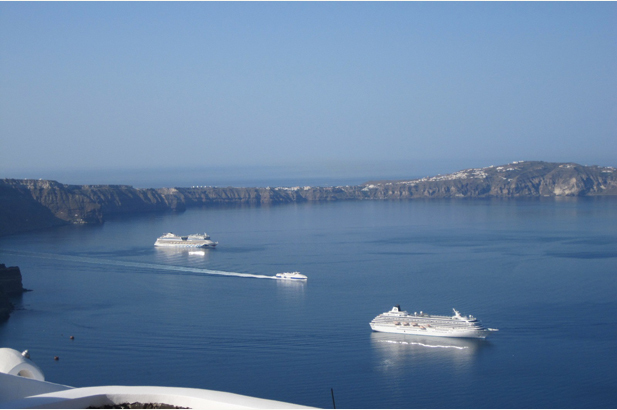 Below Oia the shimmering silvery sea silhouettes a graceful threemaster threading her way between the islands. 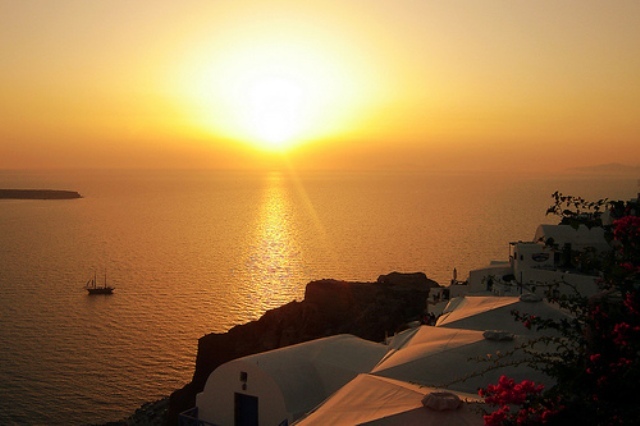 The sunsets are otherworldly (from Franco’s in Fira with a Bellini, or from Kastro in Oia with a Daiquiri they are legendary) but try that from the southern promontory of Faros, with the lighthouse on the left and the entire ring of cliffs and islands lit against a peach pink sea. 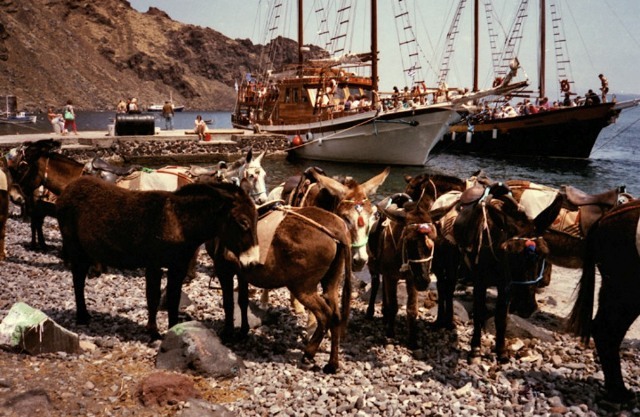 This end of the island is the last genuine agricultural part of Santorini, with the meltemi (summer northerlies) lashing at the solitary chapels, farmhouses and vines (woven into protective basket shapes), with women making local cheeses, and decorated donkeys and mules carrying panniers of harvested grapes to base instead of taking cruise-ship tourists up the cliffs to gold street. 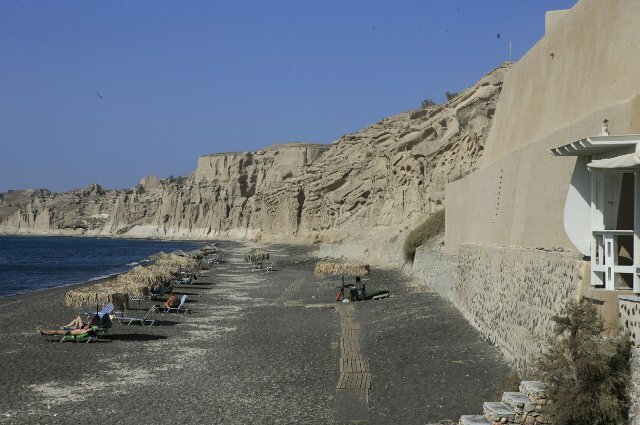 Close by here is the site of Akrotiri – destroyed in that 1450 BC explosion. 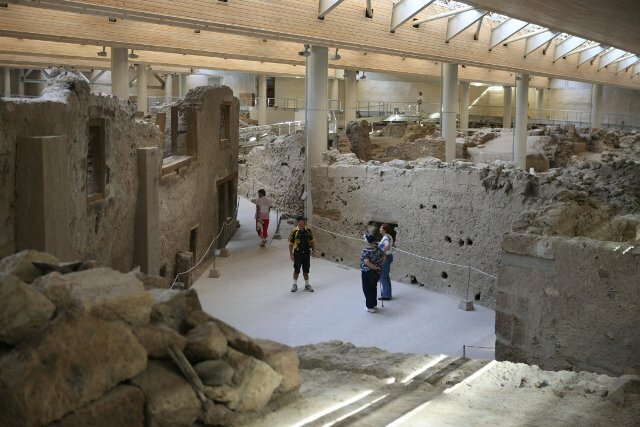 This ancient Minoan city has to be on a par with Pompeii, a whole city enveloped by crawling lava. Here the difference is that no inhabitants or their livestock and house animals were found, meaning that there had been a warning to evacuate – but to where? What do remain are wall paintings, giving a brilliant imagery of what life was like. Gazelle-like women gather saffron, blue-faced monkeys play, swallows dart and flirt, and the fleets of the king are rowed through seas filled with marine life. 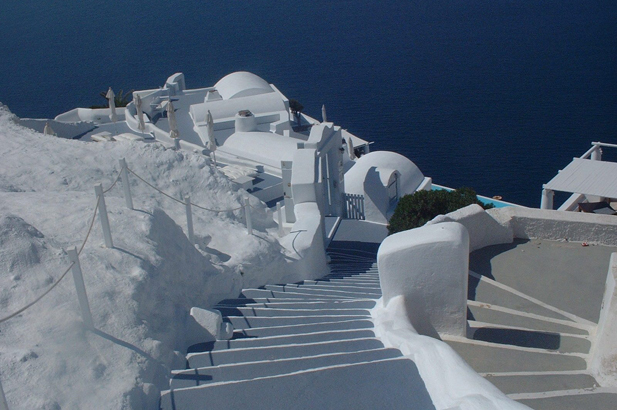 (The originals are in the National Archaeological Museum in Athens, though you may see some in the Museum in Fira, and impressive replicas in the barrel-like vaults of the Petros Nomikos Centre in Firastefani.) Excavations are still ongoing. The island has been the centre of theories on the location of the lost city of Atlantis for over a hundred years, and still fascinates those with a passion for history and legend. 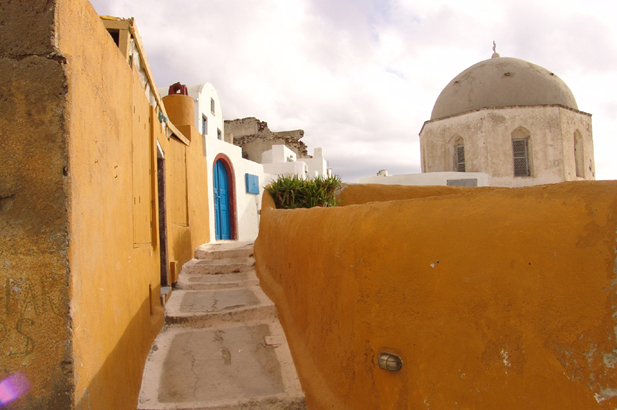 The village of Megalohori offers a glimpse of life on Santorini as it was before the tourists (though it has been restored for tourists!) 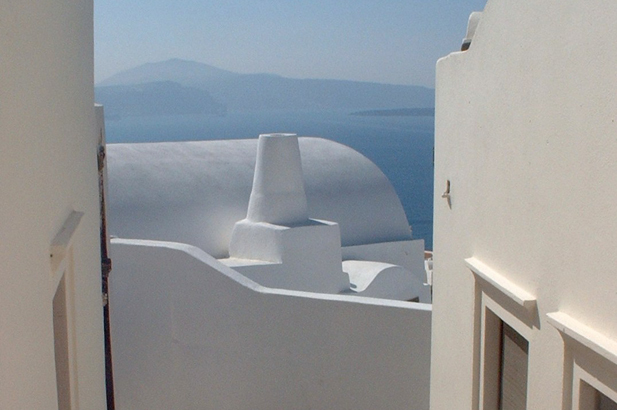 There is much more to famous Oia than meets the eye. Once the main maritime centre of the island, the sea captains lived on the inward side of the main street, and the crew members lived in descending hierarchical order downwards through the levels of pumice cave dwellings. The village buzzed in winter when the fleet was back home, and was quiet in summer waiting for the return of ships and fathers. Fabulous dining, great local specialities that are unique to the island, and wines and foods with an extra taste all owing to the magical volcanic soil. Plenty of activities for the sporty, the adventurous, and the restless. It is not an island for those with small children. 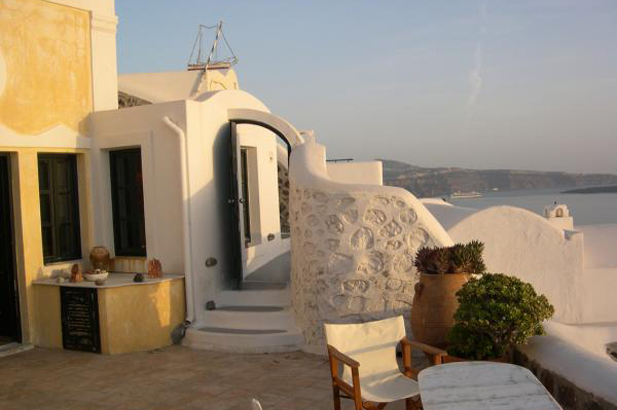 Most hotels do not even accept them so as not to ruin the honeymoon vibe that is Santorini's main tourist attraction. Winds are strong at all seasons. 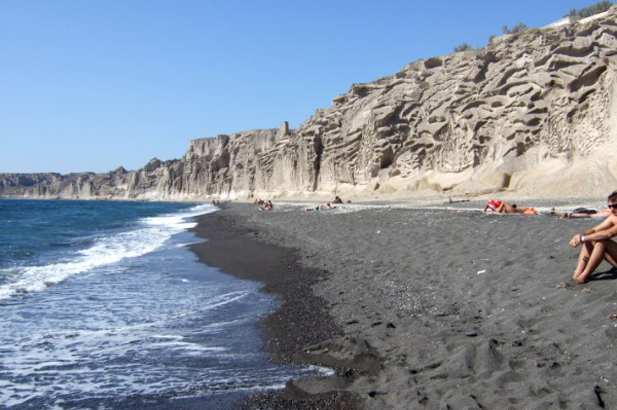 Beaches are black pumice, get scorching hot underfoot, shelve steeply into the deep and dark sea, and are crowded. High season traffic jams of belching buses bringing in the daytrippers from the cruise ships, with the accompanying tourist tat. 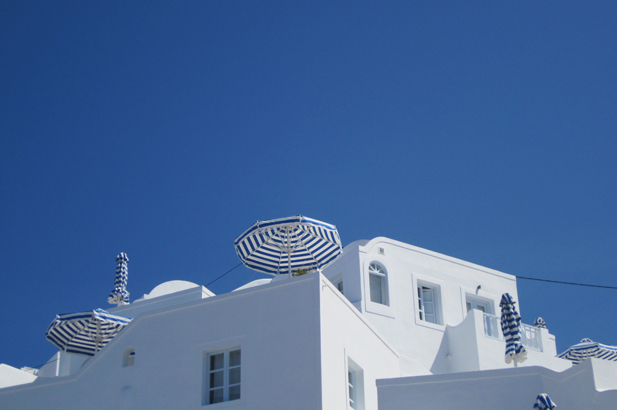 Those with just a few days to spend, those wanting to combine a stay with a visit to Mykonos, Crete or Paros, those wanting to combine a land stay with day cruising and yacht charters - the island has sensibly recognised that a lot of people want to charter a boat for a day or two. Geologists, archaeologists, hydrologists, oenologists, scientists and romantics. There have been dozens of documentaries of the lost Atlantis was here variety. Families with older children are well catered for with plenty of adventures and activities to be enjoyed. 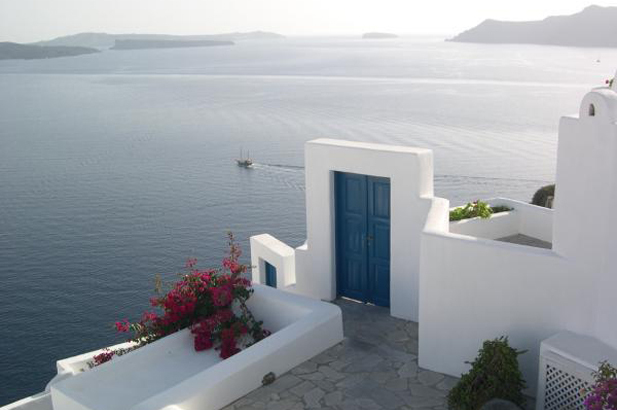 Those searching for a Greece of remote quietude. The noise of motorscooters and loud music is not to be underestimated. Space is at a premium. 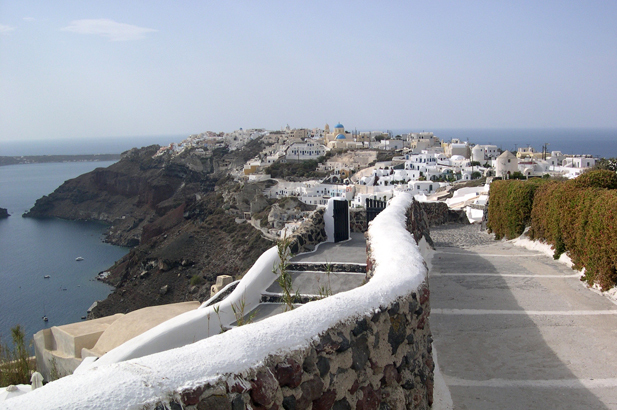 Those with bad knees or hips, or children in pushchairs - Santorini is steep and full of steps! Cars cannot get to most places so you have to be able to walk. Houses do not have gardens here, and the upmarket tourism is all clustered along the volcano crater rim, so no good for those wanting beachfront villas. Being a microscopic white spider figure on that black volcano. 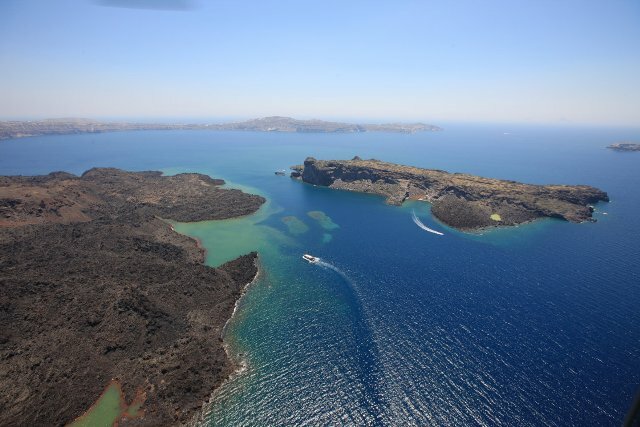 Nea Kameni is a semi-active volcano and you can climb up to the top to see the smouldering crater. Palea Kameni is home to a series of sulphurous hot springs where you can bathe in the mud. 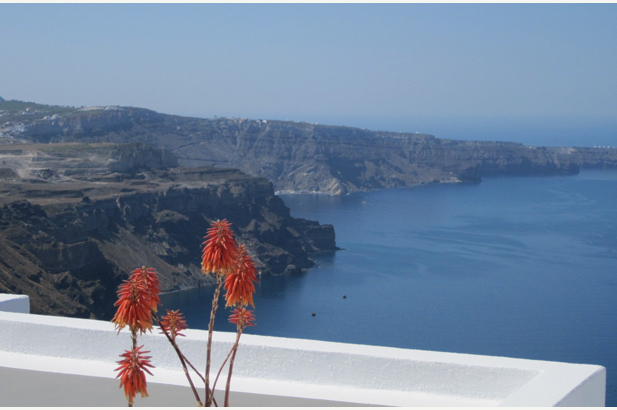 Pelican Travel (+30 22 860 22 220; www.pelican.gr) arranges day trips into the caldera and to the smoking fumeroles. Swimming off a black beach (hotter than you expect). 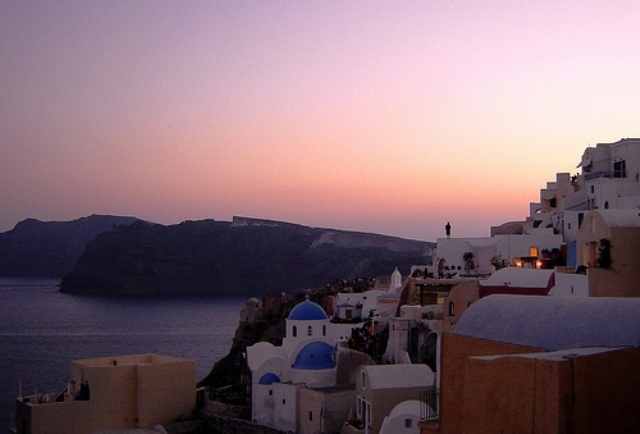 Oia at dusk. 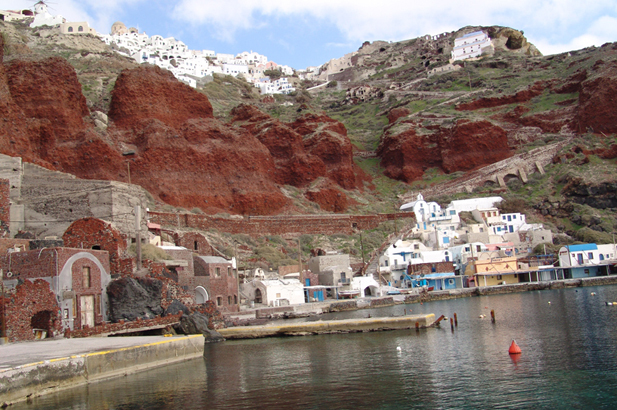 A sunset cruise in a schooner round the crater, or a trip to neighbouring Anafi and Thirassia. 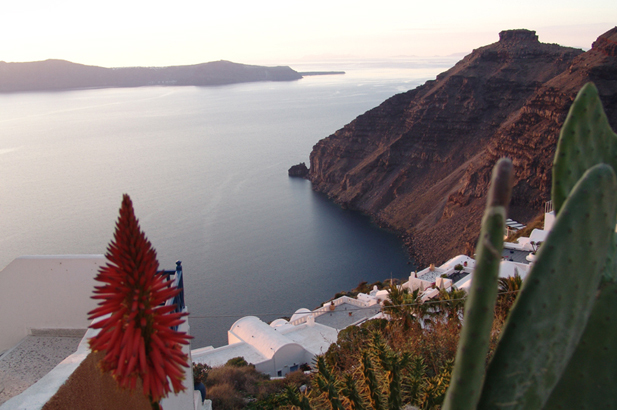 A walk along the rim of the caldera from Fira to Oia (there are many watering holes along the way), which takes four to five hours. 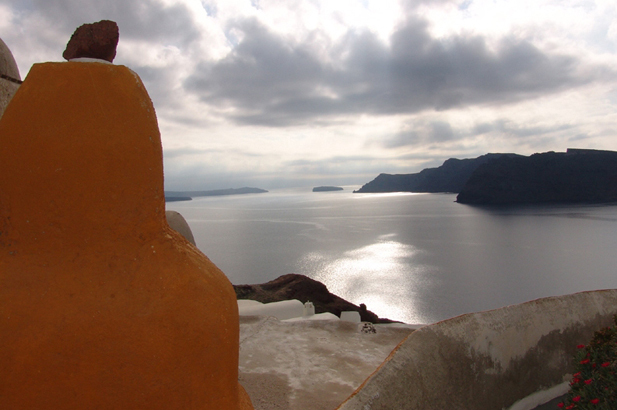 At Imerovigli, which sits on the highest point of the rim, you can see Theoskepasti, a hidden chapel with amazing views. Obviously, it's best to do this walk during the cooler months. 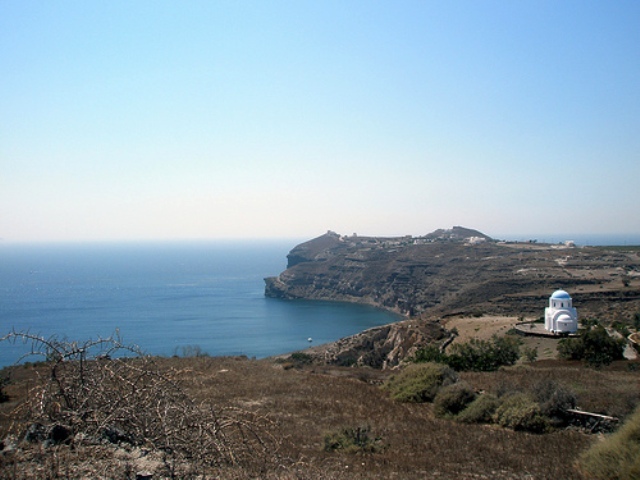 You can also walk up to the island's highest point, which is a two-mile climb from Pyrgos. 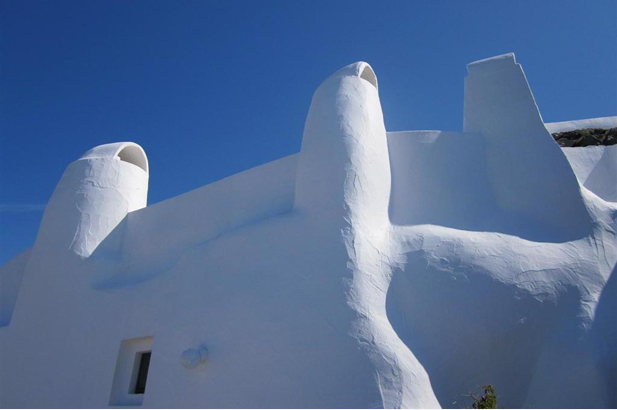 Here you'll find Profitis Ilias, an 18th century monastery with fantastic views over the island. An early morning horseback-ride along the beach, there are stables at Mesa Gonia and Megalochori. 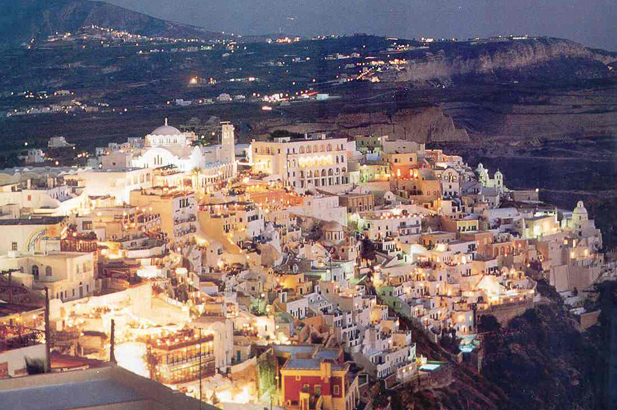 Dining possibilities: Selene in Firostefani with views to die for, 1800 in Oia, and the fish taverns in the little port of Ammoudi below Oia. 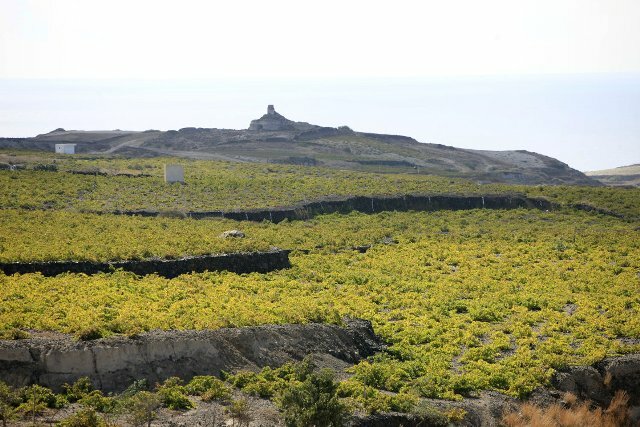 Wineries to visit are those of Sigalas, Boutari, and Antoniou. 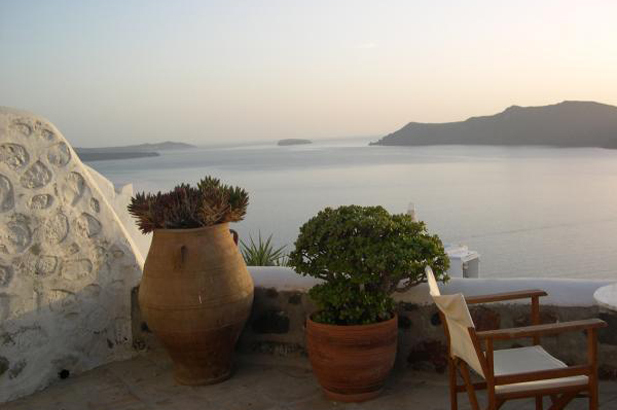 Chilled Thalassitis is a white to be tasted on your terrace at dusk, to feel all's right with you and the world. 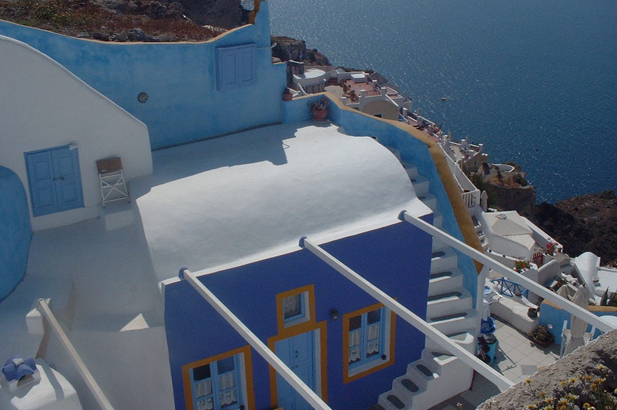 You will find some of the best meals on Santorini in the tavernas that line Oia's harbour. 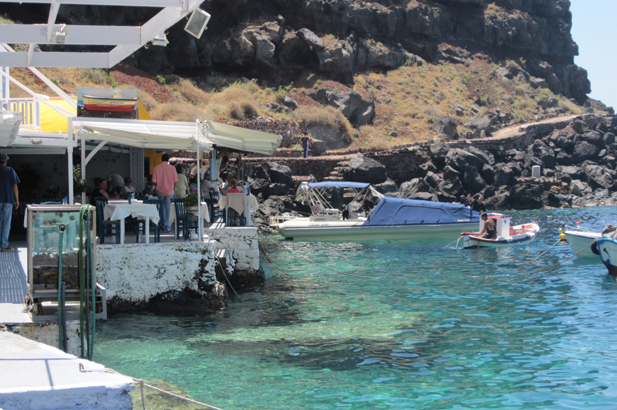 Katina is a wonderful little spot where you'll sample some of the best seafood in Santorini. Classic Greek appetisers such as calamari and dolma are served alongside mouthwatering sea bass and snapper, although it's not as cheap as you might expect. 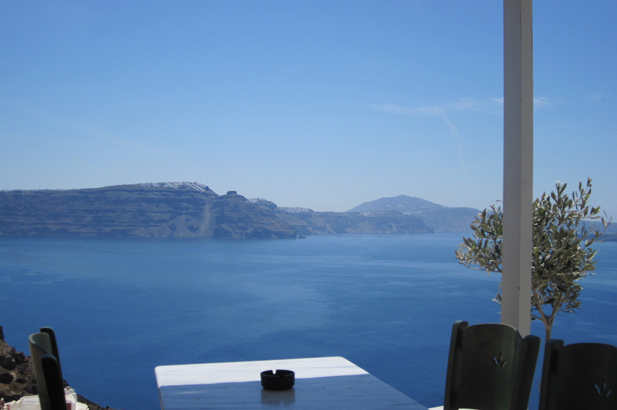 For similar fare, also try Dimitris' Taverna in Ammoudi, a couple of doors down book a table on the terrace at Archipelagosa, a converted captain's house turned restaurant in Fira. 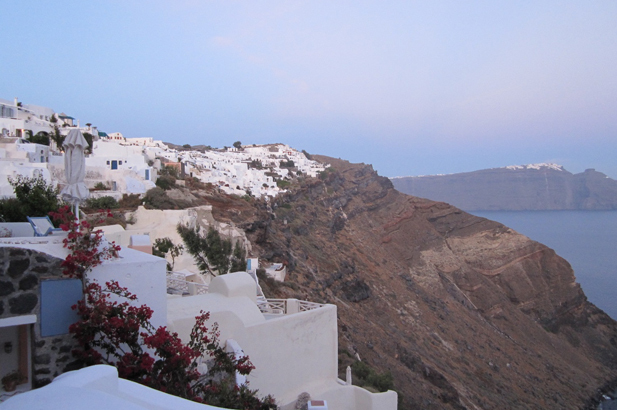 The views are great and the food - a largely international selection with pasta, risotto and grilled meat and seafood dishes - is fantastic. 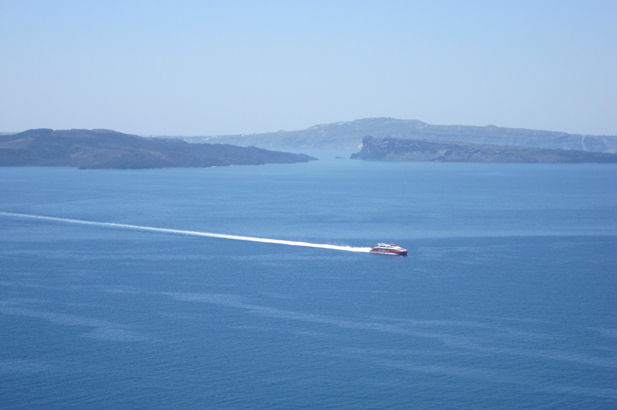 Try a speedboat for a day trip to the outlying islands. An overnight trip would allow you to experience the sensational beaches and coves of Ios. For a less watery experience, hire a donkey to take you to church. 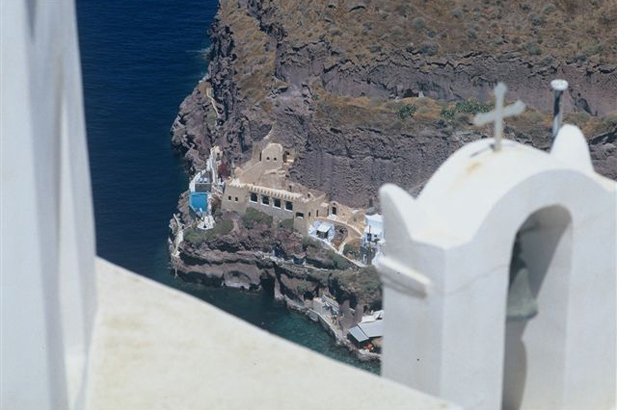 If you don't suffer from vertigo, walk down the old donkey path from Oia to the sea shore and then take the funicular up again to Oia. 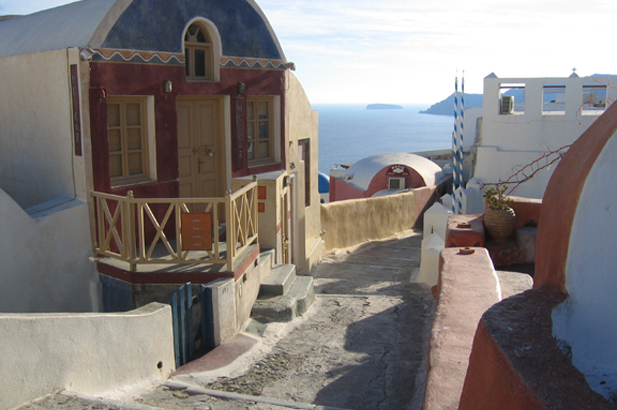 Santorini is not a great island for toddlers, but for older children there is plenty to do and adventures to be had. On the south side of the island on the beach of Perisa and Perivolos there is a large selection of water sports - two dive centres with PADI instructors (Santorini Dive Centre +30 22 860 83 190; www.divecenter.gr), parakiting jet skiing, wakeboarding, tubes, kneeboards, banana and canoes. Even a water-park with water slides. Beach volleyball, go-karts, yoga, massage. Kamari and Perivolas are the party beaches. 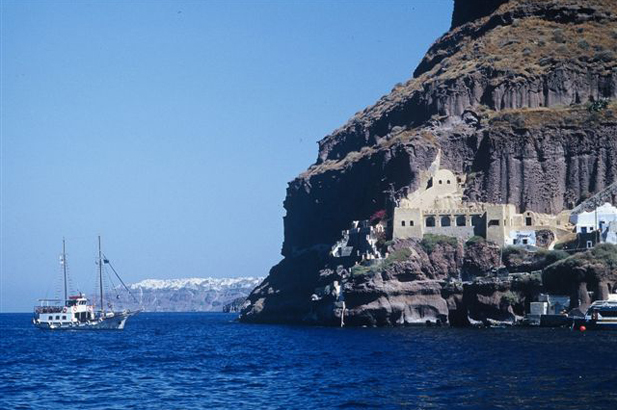 You may find Santorini's beaches disappointing. 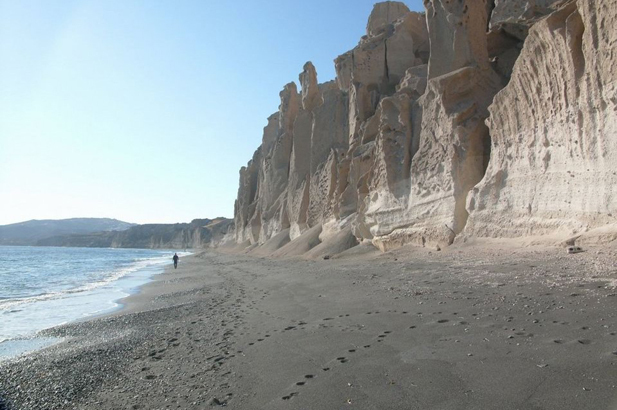 Rather than long strips of powder white sand, you'll find stretches of volcanic black sand or pebbles. That's not to say they're not good for sunbathing. However, be warned, the most popular beaches are busy during high season and the dark coloured sand tends to be scorching under foot. 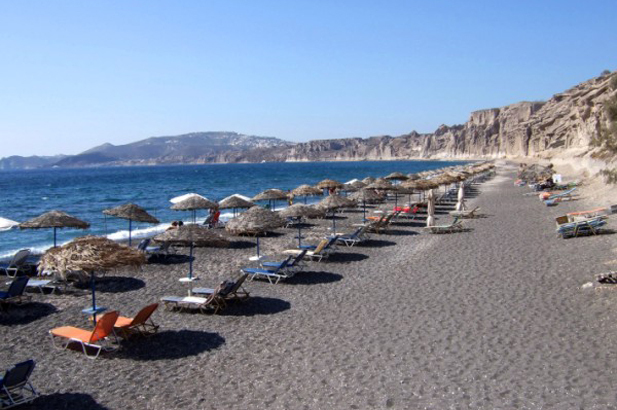 Perivolos on the southern tip of the island is one of the most popular choices, a long stretch of black sand with clear water backed by some good restaurants, it is nearly always packed. 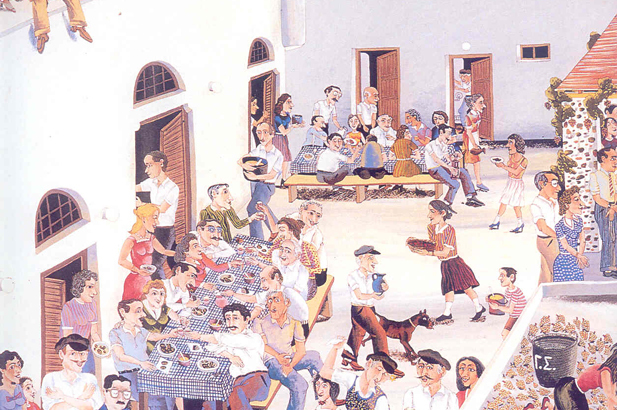 Ta Dichtia is a good local taverna, while Notos Seaside Lounge serves great drinks and food in a stylish setting. Make sure to lie to the right-hand side of the beach to avoid the local teenagers who tend to hang out to the left. Nearby Perissa is another good choice. A 7km stretch of black sand backed by boutiques, restaurants and cafes, it's one of the most popular beaches on the island. Kamari is one of the island's busiest beach resorts and is pretty charmless. The beach is pebbly, but the water is clear and good for swimming, making it popular with families. In the north, Baxedes is a small, pebbly beach that's worth visiting if you want to escape the hoards. 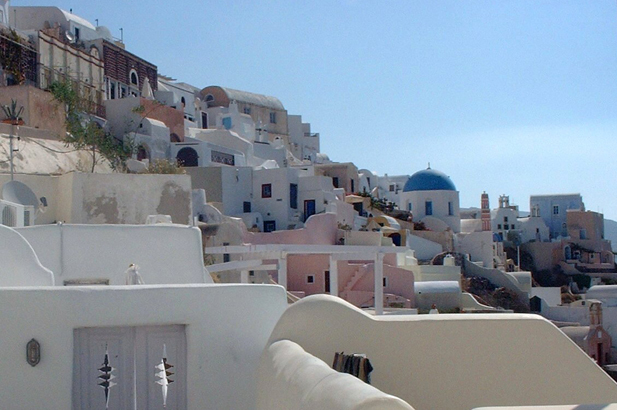 Jewellery shopping: Fira is renowned for jewellery, so much so, the main street is called Gold Street (Odos Iipapantis) and practically every shop is some kind of jewellery store. If you're looking to invest, pop into Ilias Lalaounis' boutique (+30 22 860 25 844; www.lalaounis.com). One of Greece's top designers, his largely gold designs are exquisite. 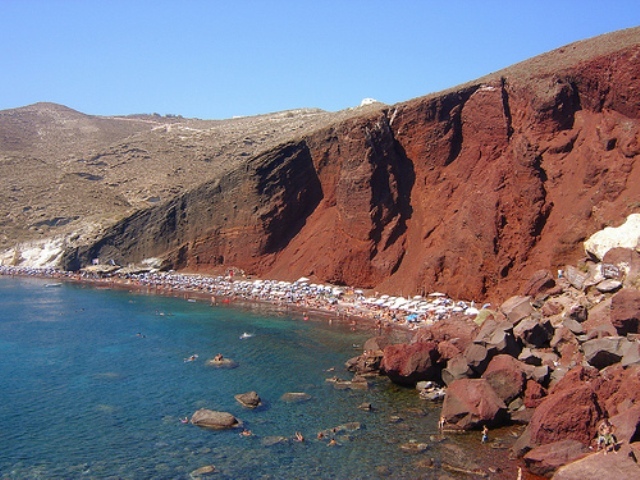 Koukla (Fira. +30 22 860 28 326; www.koukla-art.com) is another lovely boutique where you'll find contemporary pieces by local and international designers. 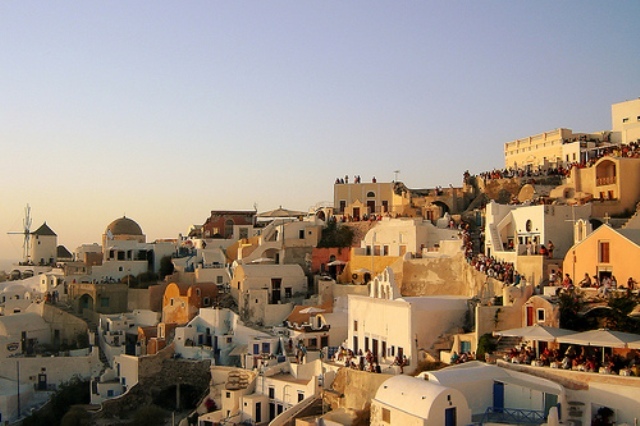 Oia is also packed with small jewellery shops and chic clothing boutiques. Pick up a pair of gorgeous earrings or a chunky bracelet embellished with semiprecious stones from Bezant (Oia. +30 22 860 71 679; www.bezant.gr)? Also try Oro (+30 22 860 71 405; www.orogold.gr), which sells beautiful gold pendants, necklaces and rings. 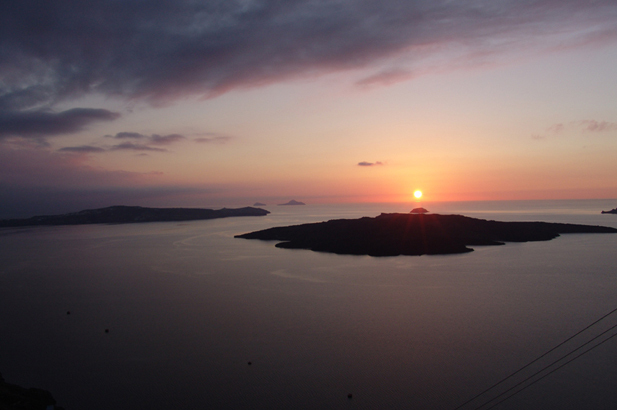 Watch the famous caldera sunset from Sun Spirit (+30 22 860 71 655; www.sunspirit.gr) a small cocktail bar with a lovely outdoor terrace close to the windmill. With small tables and big white shades, you can easily enjoy an afternoon or early evening there. The Meteor café (+30 22 860 71 015) is a former antique shop turned café/bar that attracts a stylish clientele who flock here for the cocktails and desserts. 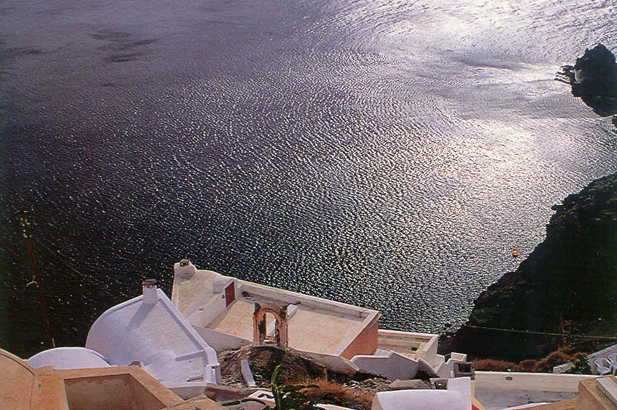 Azur (+30 22 860 23 560) is a new lounge bar on the clifftop in Fira that's popular with visiting Athenians. Others say to avoid it! If you're looking to party try Tango (+30 22860-25469; www.tango.gr), which is the only club with view of the caldera, or Casablanca Soul (+30 6977 57 5191) which hosts guest DJs from Athens and abroad. 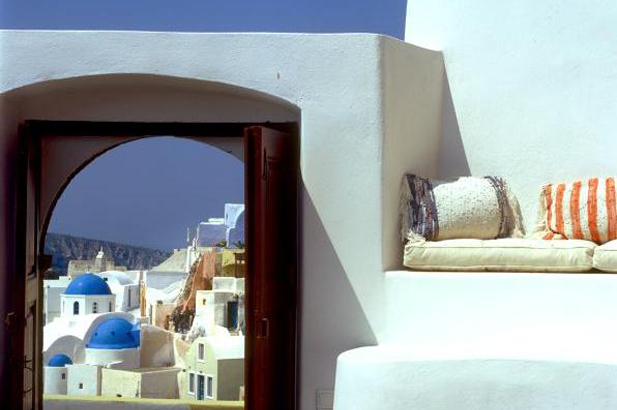 If you are looking for quiet village life and peace even outside the serenity of your villa, don't even think about Santorini as a destination in July and August. Giant cruise ships disgorge hordes of daytrippers in coaches all day long bringing hassle and hustle to the island. Lesser restaurants have their meals imported frozen and service is compromised, though the better restaurants maintain their quality. The Gaia winery (home of Thalassitis) at the old tomato factory (near Perivoli restaurant at Avis Beach) is open in August for the harvest. May/June and September/October are the most gorgeous - for softer light, still warm swim temperatures, and far less people. Spring is divine, and once August is out, the island is truly magical and worth every amount of purple prose written about it.